Caffeine doesn’t ask silly questions, caffeine understands. Caffeine understands that it’s 4 in the morning, that it’s a Monday, that my toddler crawled into bed with me at 11:30 and slept horizontally pressing her tiny little toes into my side all night, and that I have a 10 mile training run to squeeze in before a full day’s work. Every morning when my alarm goes off, caffeine feels like my very, very best friend. Runners have long been imbibing the world’s most popular drug. In 1972, Frank Shorter famously swigged his flat Coke along the Olympic marathon course in Munich and won the gold medal. In moderate doses, caffeine has been shown, in many scientific studies, to improve athletic performance and increase endurance. The consumption of caffeine has many effects, a lot are good, some are bad, and more importantly how much should we be using? Caffeine can boost performance. Here’s how, it encourages active muscles to use fat as fuel which delays depletion of glycogen by more than fifty percent. This allows the body the ability to reserve those critical stores for later in an endurance sport. Additionally, caffeine stimulates the central nervous system which can improve concentration, focus, and mental alertness which can help runners navigate running challenges. Think: pot-holes, dodging other runners, navigating tight turns, or uneven terrain. It also increases speed and power output, improves endurance, and has been shown to assist with recovery. High doses of caffeine can cause headaches, difficulty sleeping, tremors, restlessness, upset stomach, and irritability. It’s also a diuretic and a laxative which can cause an increase in bathroom stops which we can all agree is never a good thing on a run. Here’s where is gets downright scary, in massive doses, caffeine can cause seizures and death. It’s good to remember caffeine is a drug. Here are a few general recommendations when using caffeine. *Use a low to moderate dose. What’s right for you will vary on your size, weight, and how much caffeine you tolerate, this is called a dose-dependent effect and is true for most drugs. Moderate has been generalized as anywhere between 200 to 400 milligrams a day. *To get the full benefit of caffeine, it should be ingested about 30-60 minutes before the workout or race. The body typically eliminates half of the drug in 3-5 hours, but the remainder can stay in the body for another 8-14 hours. A good rule is to limit caffeine at least eight hours before bedtime. So for me, no caffeine after noon because I have the self imposed bedtime of a toddler. *Energy drinks have less caffeine in general than coffee, for example Red Bull contains roughly 80 milligrams versus coffee’s 95-200 milligrams (caffeine amounts in coffee vary on the brand). However, most energy drinks have a ton of sugar and other “supplements”, none of which our bodies need, and the additional manufacturing of these drinks leaves most researchers wary of them. *Whatever your choice of caffeine is, figure out what works best for your body and then stick to it so that your body gets used to the effects. Caffeine should always be pre-tested in workouts and not something new that you try on race day. *Some evidence suggests that avoiding caffeine for 24 to 48 hours may increase it’s effects because the tolerance built up against caffeine may delay the ergogenic (performance enhancing) boost you receive from it. I drink 1/2 of a sugar-free Red Bull about 20 to 30 minutes before my run every day. If it’s a particularly hard training run I use 1 Energy Sheet or 1 Buzz Bite. In the afternoon I usually drink a Bai drink which has 35 milligrams of caffeine. For marathons I use between 1 and 2 Energy Sheets and between 1 and 2 Honeystinger Energy Gels with caffeine. *I order the Energy Sheets and Buzz Bites on Amazon, I buy the Honeystingers at our local running store, and our local grocery store carries the Bai drinks. Total: approximately 175 mg- on average per day (Race day caffeine consumption would be higher). Honestly, I’m relieved. I was worried that my caffeine consumption was bordering on high. Caffeine is the world’s most popular drug with 90% of the population of the United States consuming it in some form every day. As long as our intake is moderate, caffeine has some benefits that will help us zip along the road, buzz up trails, and power our way to PR’s. Happy running friends! 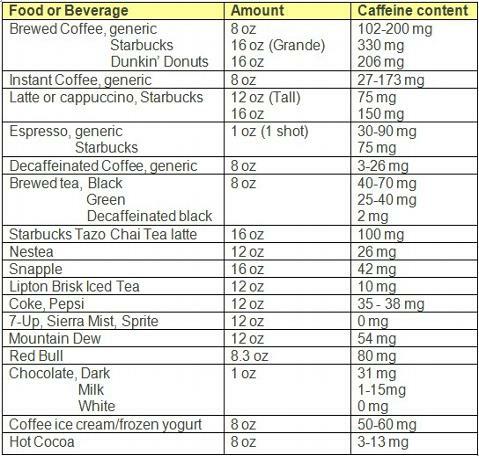 Use this caffeine chart to check in with your daily amounts. How much caffeine are you using everyday? How do you like to use caffeine? What are your favorite types of caffeine? Disclaimer: I am not a doctor or a nutritionist, I am just sharing what has worked best for me. I am in no way promoting the use of caffeine. I’m with you on whatever it takes. I did a caffeine free run today and it was not pretty. That little extra boost really helps power me through. Happy running Jennifer! I usually drink one cup of coffee about an hour before a run. Sometimes I only drink half a cup as I’m rushing around to get going and I don’t notice until later, but I’m a morning person. I like to have a latte after for some protein and fat, and sometimes I make a matcha green tea with milk and honey. So glad you shared! I think it’s so important to figure out what works the best for you body. Happy running Emma!